Scotland's First Minister, Nicola Sturgeon, plans to pursue a second referendum on independence. The decision shouldn't come as a surprise, given the UK is gearing up to leave the European Union even though the majority of Scots voted to remain during last year's referendum. That doesn't make it a good idea: a vote would likely require the support of UK Parliament, Scots are divided over the nation's path forward, and it's unclear whether an independent Scotland would have sound financial footing. Sturgeon's revelation almost overshadowed Prime Minister Theresa May's announcement that she intends to invoke Article 50 - starting the clock on the UK's withdrawal from the European Union - on 29 March. 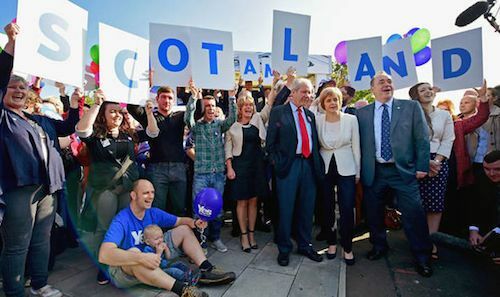 The First Minister unveiled the plan at her personal residence in Edinburgh rather than at the Scottish National Party's (SNP) annual conference, in order to appear non-partisan. She cited a breakdown in Brexit negotiations with the UK government, reiterating her claim that Scotland is being held hostage by right-wingers in Westminster determined to achieve a 'hard Brexit'. Importantly, she called for a referendum between autumn 2018 and spring 2019 - before Britain leaves the EU but after the terms have been negotiated - to ensure Scottish voters can make an informed decision. However, it's unclear whether any such referendum will take place. Only UK Parliament has the right to conduct one, and May - reluctant to see the UK dismantled on her watch - has made it clear that she has no desire to repeat what Sturgeon called a “once in a lifetime event” in 2014. The SNP would struggle to run its own referendum without public funding, and Unionist parties would likely boycott it, meaning its results could be deemed illegitimate. Even if Scotland organises a referendum, it would be complicated by international politics and differing views among voters. The Spanish and Belgians, reluctant to see Flanders in Belgium or the Basque or Catalonia regions of Spain follow Scotland's example, could oppose efforts by an independent Scotland to rejoin the EU. Moreover, while 62% of Scots voted for the UK to remain in the EU, 34% of SNP supporters voted to leave. If the ruling party campaigns on leaving the UK then rejoining the EU, it could easily lose support. Scots are also divided in their desire for an independent Scotland. A recent survey found that only 44% of Scots would vote for independence, while the rest would vote to remain within the UK. Other polls suggest more than 40% of Scots oppose holding another referendum before Britain leaves the EU. Sturgeon may see Brexit as an opportunity to push for independence, but her party might shy away from courting a second referendum defeat. Finally, an independent Scotland could struggle financially. The SNP fought for the first referendum when oil cost $100 a barrel, but it's nearly halved in price since then, hampering the growth prospects of the EU's largest petroleum producer. The upshot has been a mounting budget deficit and the risk that Scotland's credit rating might be temporarily reduced to ‘junk’ level, deterring foreign investment. The Scottish government could be forced to raise taxes or cut spending severely, neither of which would be popular. A financial disaster in Scotland was a key motivation for its union with England in the first place. Secession could spark another, and joining the continental union might not be as simple. Sturgeon should think twice before she cuts Scotland loose.